Half Price Membership Until May 2018! Totton & Eling Cricket Club has built a reputation over many years for being a great local ‘Cricket & Social Club’ with a real ‘Family’ feel. In our modern clubhouse we offer superb facilities including FREE Wi-Fi, Juke box, Flat screen TV’s, Quiz and Fruit Machines. Aside from being a Cricket Club, we show all major Sporting Events on our large flat screen TV’s, but you don’t have to be a sports fan to enjoy being a social member at Totton & Eling Cricket Club. We hold various Club Events, and have a Children’s Play Park for the under 10’s plus 1.3 acres of cricket field!. Basketball nets and goal posts are availablefor older children along with much more for our members to enjoy! We also host Special Guest Dinners and in the past have hosted Lawrie McMenemy, Graham Gooch, Mike Gatting, and Matt Le Tissier. Social Membership is Annual and runs from May to April (month of May to renew). Membership costs only £25 for single membership or £35 for joint membership. A special rate is offered for Senior Citizens, £20 for single membership or £30 for joint membership. At the end of April we have a Membership Renewal Night with entertainment to kick off the new membership year. 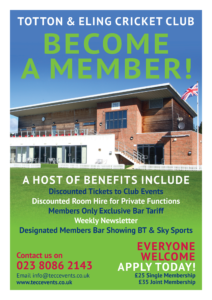 The Members Bar is for Totton & Eling Cricket Club Members, but members family and friends are also welcome to accompany you. Outside of the cricket season The club is generally closed on Tuesdays, unless there is a Room Hire or a large televised sporting event. – Information of Tuesday opening will be in your weekly newsletter. *Club Rules & Regulations Apply and can be viewed by clicking to the relevant tab to the right of this page. To become a Social Member of Totton & Eling Cricket Club, click on the relevant tab to the right of this page and download the Membership Form. Please complete the Membership Application Form and bring it with you to the club, along with the appropriate membership fee in order for us to process your application. Payments must be made in person by cash or debit card only.